OK, so we all know this is a scam right? Well, apparently not. This is one of the most common questions I’m asked by clients. They must realise it’s a scam otherwise why wouldn’t they all be signing up for these cheap seo campaigns with guaranteed results? But it certainly catches their eye and sticks in their mind, although they have the sense not to sign up for it. So how does it work? My name is Louise and I’m from Teesside. I’m confident in assuming you receive (and probably ignore) plenty of emails offering services similar to ours; this makes it very hard for me to stand out but I hope I will do by writing a personal email that makes sense. We are Google Partners that specialise in Search Advertising & Mobile Advertising. This means we really can generate new business for you online. You don’t need to simply take my word for it either; go to www.google.com/partners and search for my business name. You’ll find us. If boosting your online presence is something you’re interested in why not let us put together a free proposal for you?. I understand if you are already using a similar service; we would be happy to review the work currently being done for you. Either way all new customers get £100 free credit to get you started. To be fair, this is actually better than most I receive, many are in broken English and the vast majority are sent from generic gmail accounts. I’m pretty good at swiftly going through blocking and deleting them. If it comes from a gmail account it is just deleted, after all what kind of business doesn’t have their own domain name to send emails from? Oh, unless it’s spam of course and they wouldn’t want to get their own domain blacklisted. So, can they Push your Website onto Googles First Page of Search Results? Yes! …. That’s possibly not the answer you are expecting, but it’s true. Essentially this company are offering to set up an Adwords campaign, so pay your money and you can be on page one! If it’s True, What’s the Problem? Firstly it’s claimed to be a personal email, it obviously isn’t, because I’m an SEO consultant and offer Google Adwords to my clients, if it were personal, surely she would have realised that and not bothered wasting her time. This is the bit which annoys me the most though “I know many others make the same claim but most of the time they have nothing to back it up”. Rubbish! 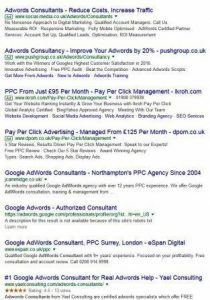 If you don’t already know about how paid advertising works, you pay your money and get your clicks, in very simple terms, if you pay enough for any keyword you can appear on page one. Therefore pretty much any online marketer can do this for you, in fact many people can do it themselves. The £100 free credit? That’s something offered by Google anyway. What I dislike about this is the short term view. I work with my customers and will sometimes use Adwords (or other PPC platforms). But this is only for highly competitive terms, I explain the reasons for using it, typically because their competitors have much stronger, well established websites and have been sending a lot of money on SEO, so it’s very difficult to compete with a limited budget. We give it a try, measure the results and if they aren’t getting the ROI, we stop again. Adwords can be a very good way to throw money away if you don’t know what you’re doing! The big difference is that SEO achieves long lasting results, with PPC, once your budget’s gone, it’s gone, you have to top it up again to get that first page placement again. Don’t get me wrong, it certainly has it’s place in an online marketers toolbox. But it’s not the magic bullet which will push your website onto page one as these companies would imply. Sometimes I’m contacted by companies who don’t use PPC for first page results. Can they do it? Yep you bet! But again, it won’t do you any good signing up with them. But that’s a post for another day….